When Jesus visited a town, he shared his meals with everybody who wanted to be with him. Everyone was welcome at the table – to share both food and friendship. 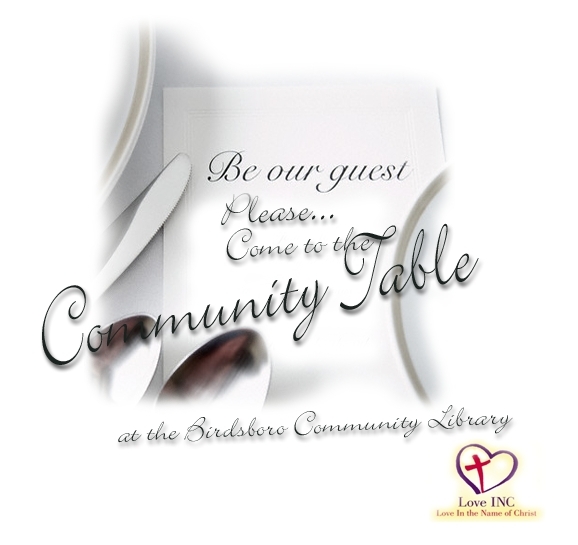 We are all welcome at the Community Table. Come enjoy good food and get to know your neighbors. Some of us will bring food to share. All of us will bring the gift of our selves to give in friendship. We will share our meal together family-style and enjoy each other’s company. After dinner, we’ll enjoy the music of Heart Strings. Anyone who wants to may stay awhile after the music to pray and to talk about how we can work together to meet the needs of our neighbors. Call Hopewell Love in the Name of Christ – (610) 385-0772 for more information.